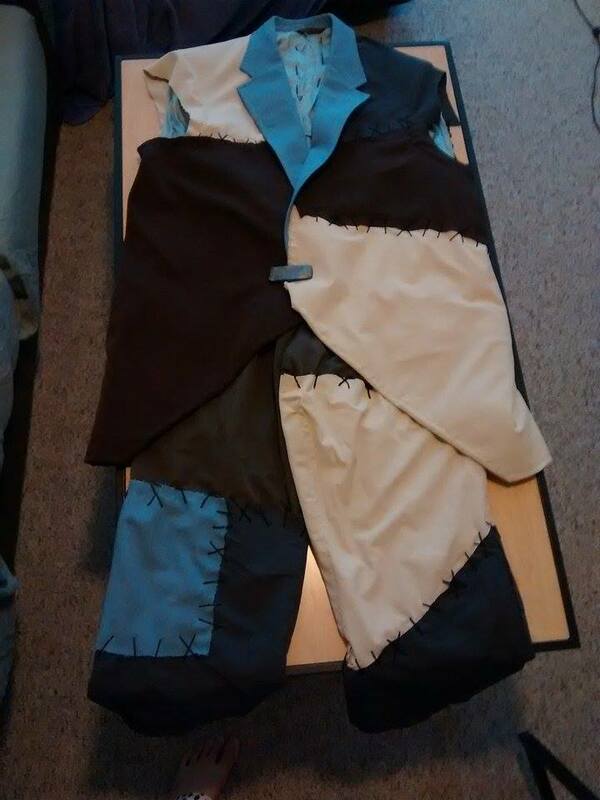 After sewing on this piece off and on these past couple of weeks, and making multiple runs to the fabric store. A few weeks back I posted a work in progress post about it. Well, I can finally say that the main part of Exemplar’s cosplay is completed. Yay! This outfit was created by buying a pair of pants and a jacket at Goodwill. Then I went to Hancock Fabrics (I love that store) to collect a random collection of fabric, about half a yard in each color. After we got back, I made my boyfriend put on the suit and outlined where I wanted the patches to be at based off a reference photo. Over these past few weeks I have been sewing on the patches. This past weekend I got some embroidery floss and added some details. We also used clay to create a button for the front of the jacket. All that is left now is ironing the collar down, creating his pike and a makeup test run then it will be completed! I’m so excited!